Enjoy an exotic feel in your bedroom with this fun Zebra pattern. They work great in your guest room, but these sheets can set the tone in your room too. 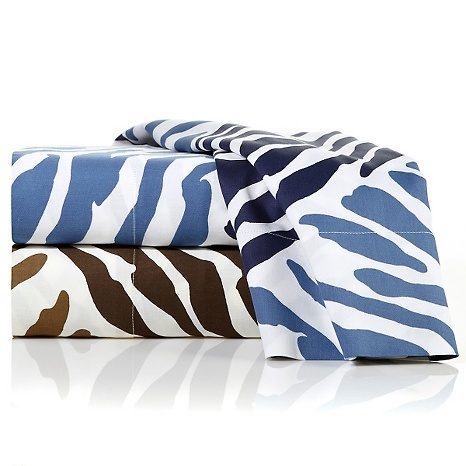 Relax with this bold animal stripe that adds a pop of color and a fun pattern. Serving their purpose, these gorgeous animal prints take you on a wild ride, without you ever having to leave your home. Available in Blue and Neutral Zebra. When laundering, promptly remove sheets from dryer and smooth them out with your hands before folding or making the bed. Alexa Hampton is a notable designer with the talent, history and credentials to create luxury design. Her Alexa Hampton Home collection offers an approachable and affordable product that brings her designer experience to life in your home. For those looking to furnish their space with high-end flavor, this collection presents gorgeous classic designs you can re-create at a reasonable cost.